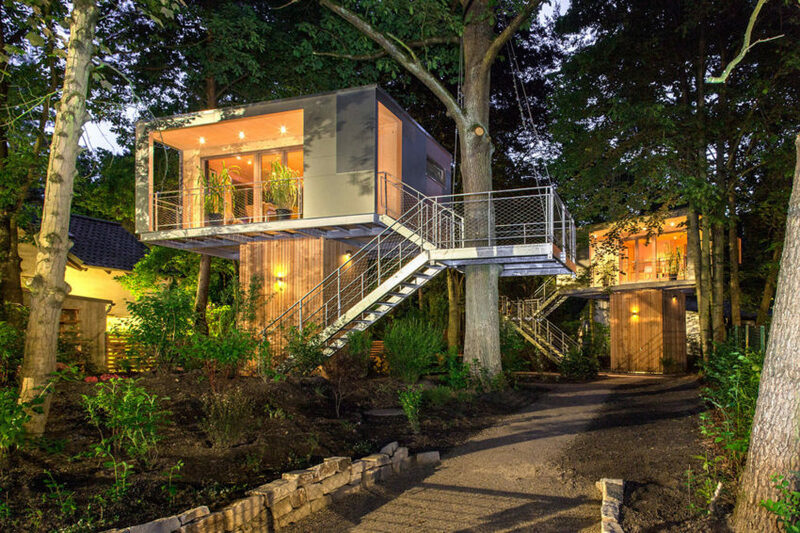 Urban Treehouse is a unique private residence located in Zehlendorf, Berlin, Germany. 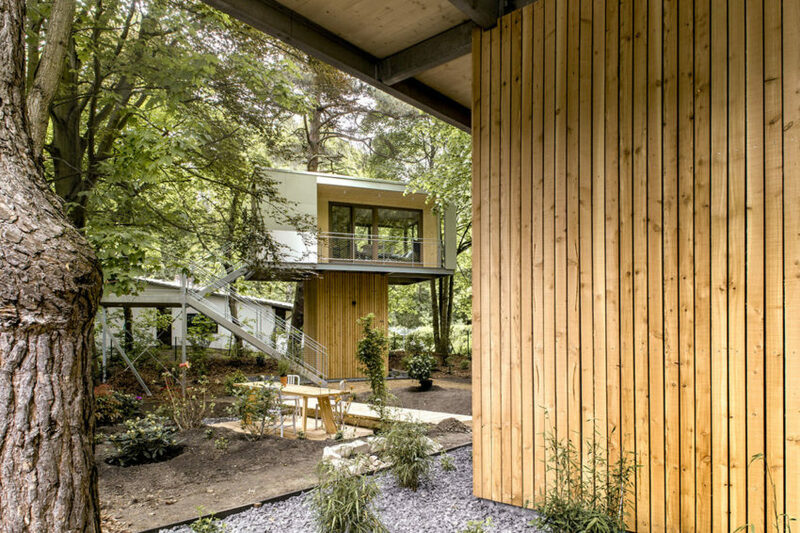 The home was completed by baumraum in 2014. 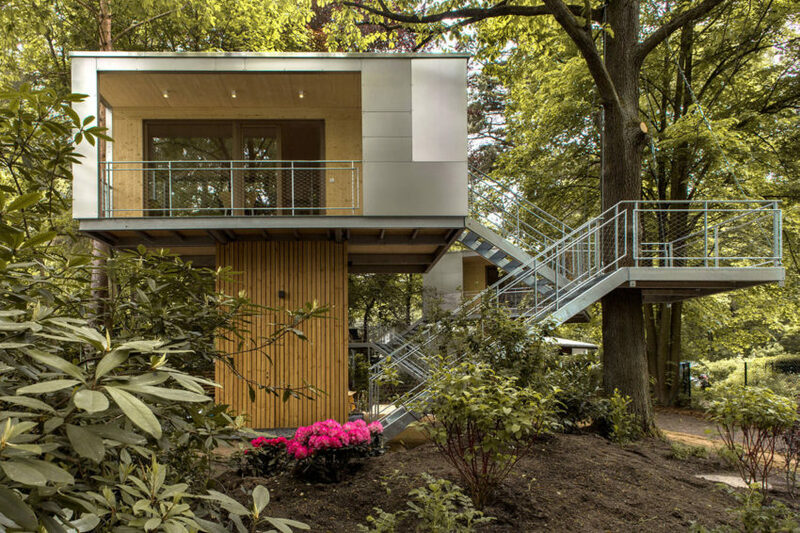 “The Urban Treehouse is a family project and is based on the initiative of the grandfather Hans-Joachim and his grandson Kolja, who ultimately implemented the project. 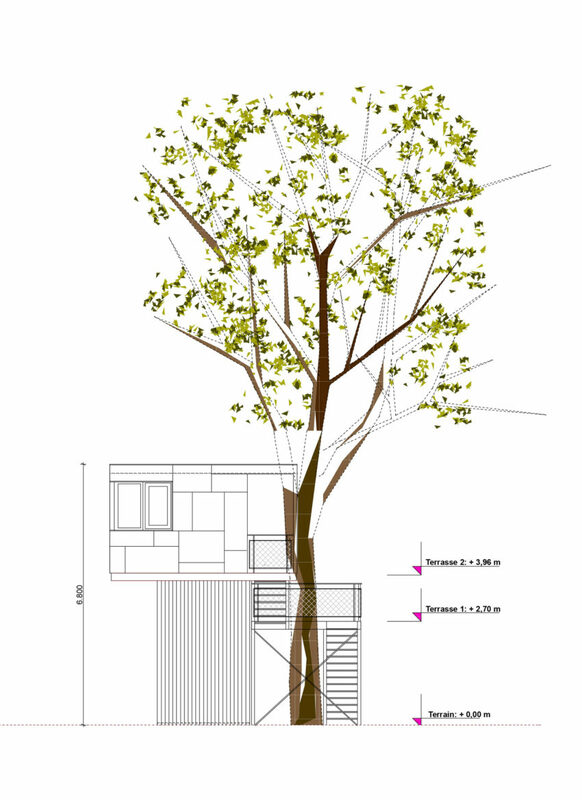 Once more, it is conceived as an experiment and a research project for new construction and housing in tune with nature. It is intended to serve as an oasis and inspire friends and guests of the family, as well as students and those interested in architecture. 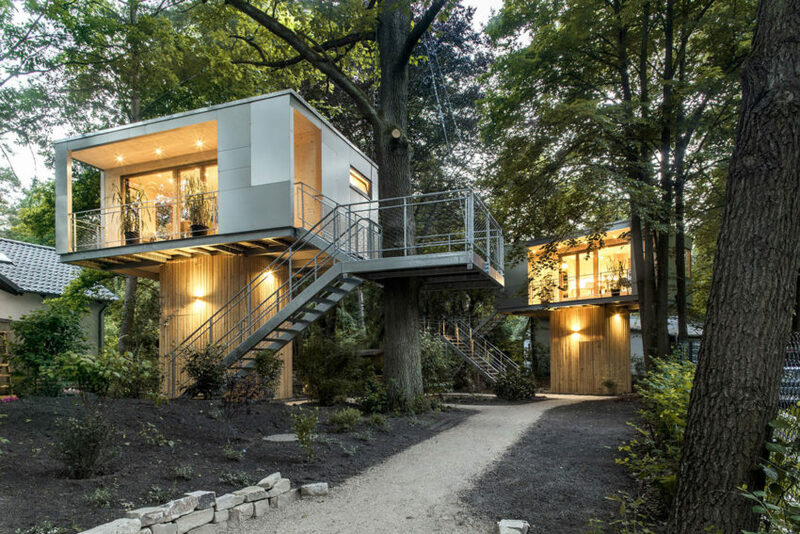 We were very enthusiastic when the developer, Kolja Stegemann, approached us with the idea of implementing treehouses in the urban environment of Berlin. 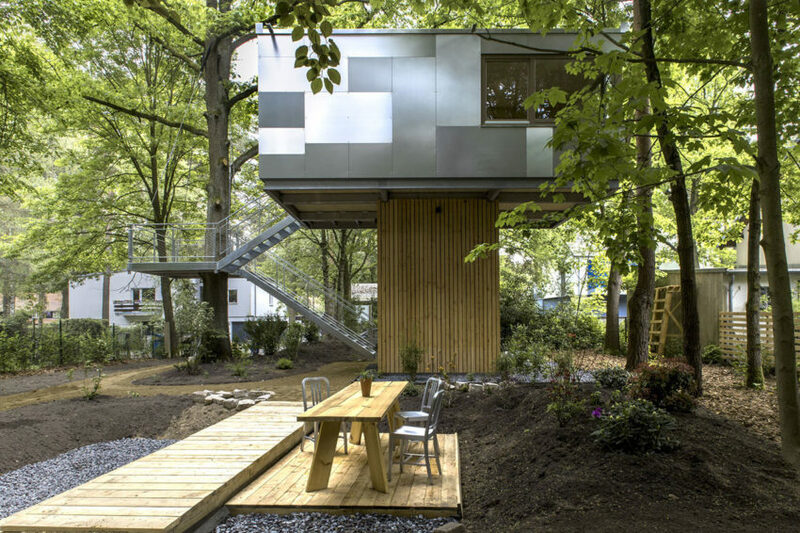 Treehouses are normally associated with a rural environment or natural surroundings. Thus, such an undertaking is somewhat rare and very appealing for a planner. 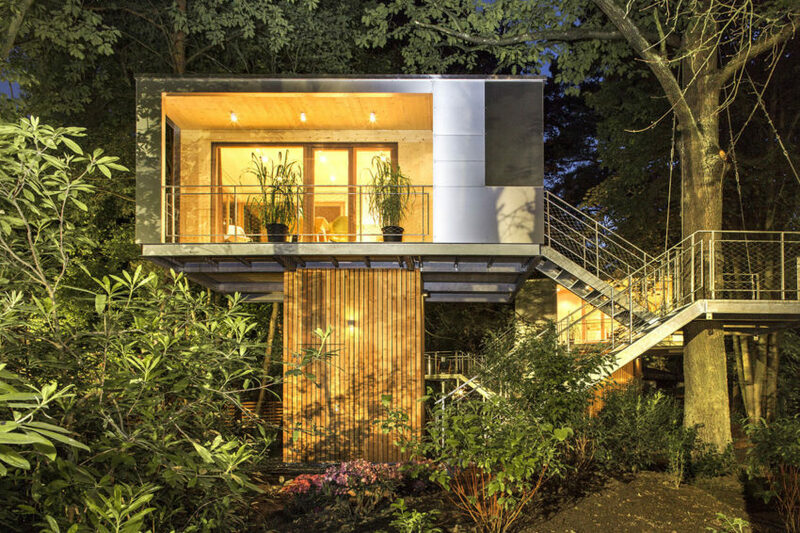 In Berlin, one is in good company with regard to small, extraordinary buildings. Here, there mare many alternative projects, which often with small budgets occupy niches in the city. As planners, we looked forward to contributing to the tradition of architectural culture in Berlin through this task. The district of Zehlendorf is characterised by somewhat bourgeois residential buildings with larger properties and gardens. There are not many multi-storey residential buildings here, unlike many other parts of Berlin. The special feature of the site lies in its outstanding location. 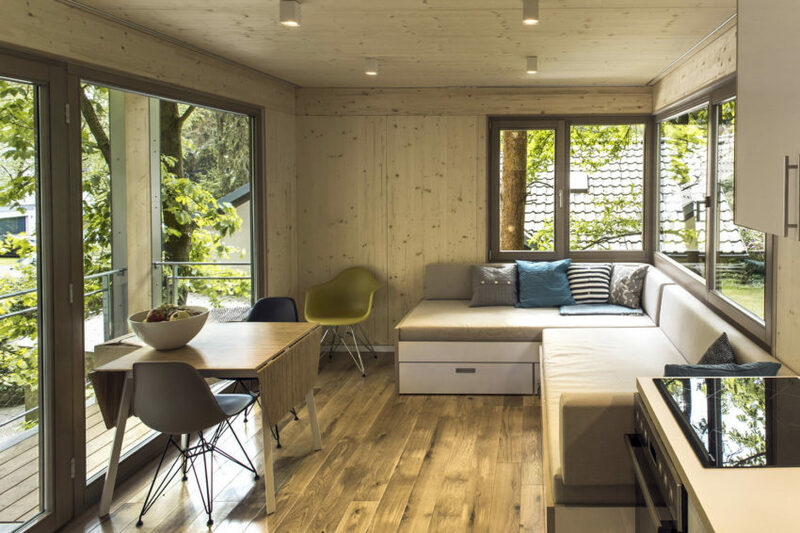 Bordering the forest, it is located in the immediate vicinity of the beautiful lakes of Krumme mLanke and Schlachtensee. The fact that this land was not built on earlier is surely a stroke of luck and is certainly due to the specific demands of the family. 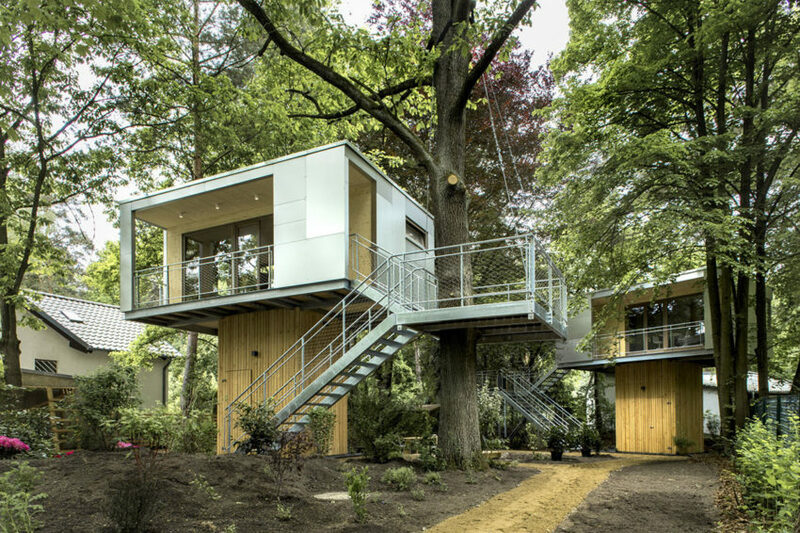 The treehouses were to cover a relatively small proportion of land. Thus, the usual requirement of using the last available square metre profitably does not apply here. 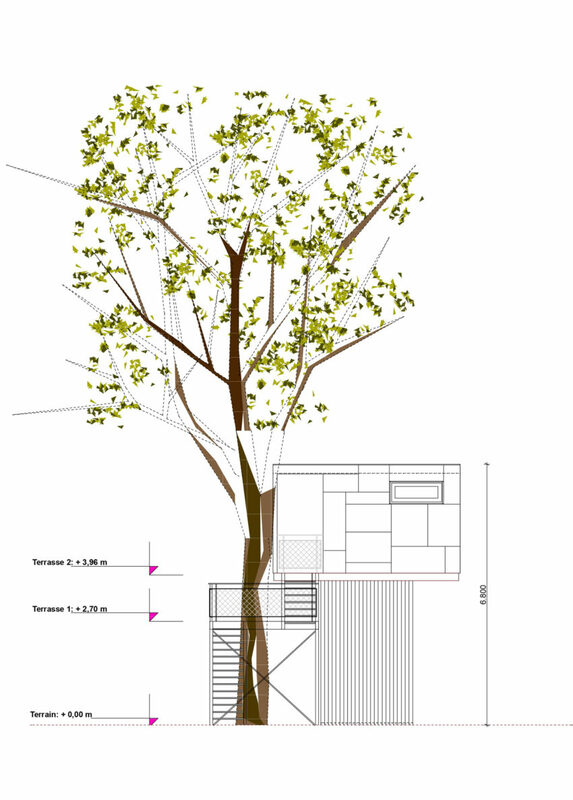 Of course, the preservation of the tree population on the 650 square metre (6,996.5 square foot) garden property was one of the essential concerns of the developer. 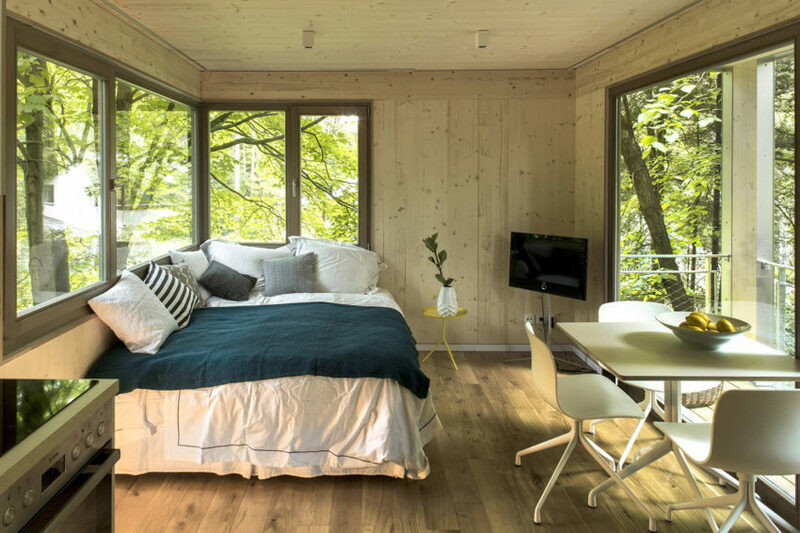 After studying various designs, two cubic units were created – each with 21 square metres (226 square feet) of living space. 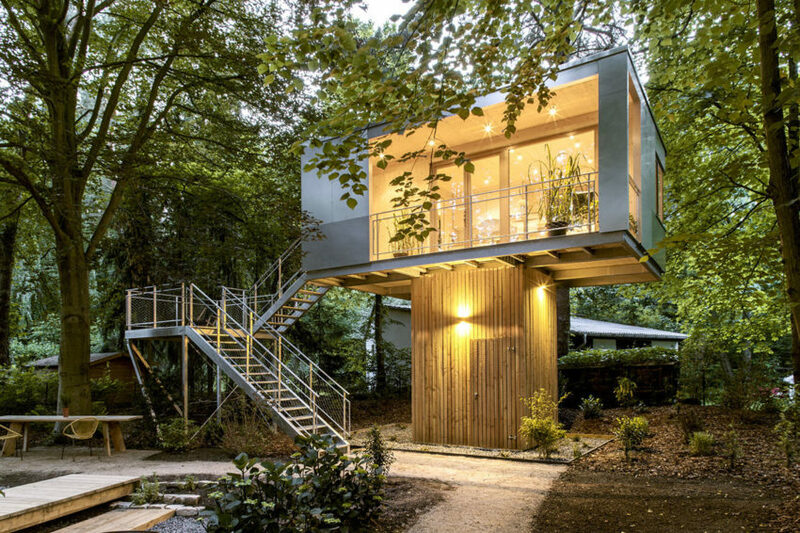 Both buildings hover on a four metre (thirteen foot) high base and are equipped with a covered exterior surface at the same height, as well as a lower terrace at a height of 2.60 metres (8.5 feet). 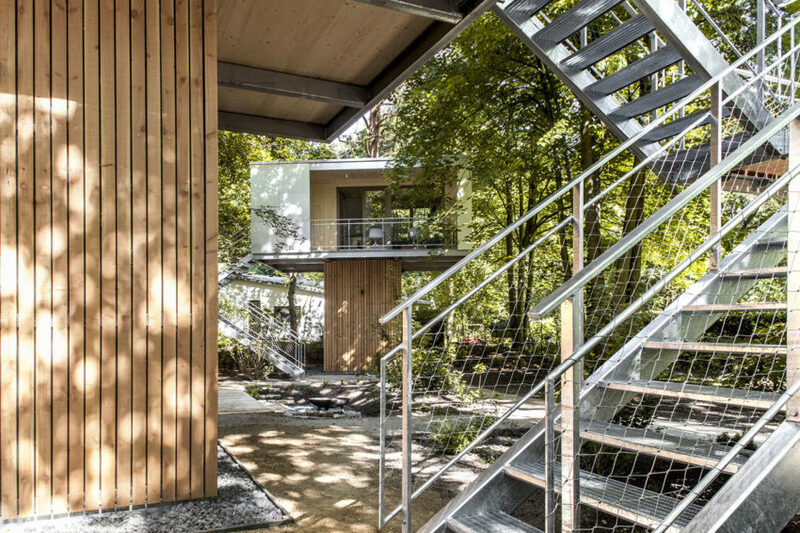 For one of the treehouses, the intermediate level and both flights of stairs are supported by flexible suspensions from the oak. 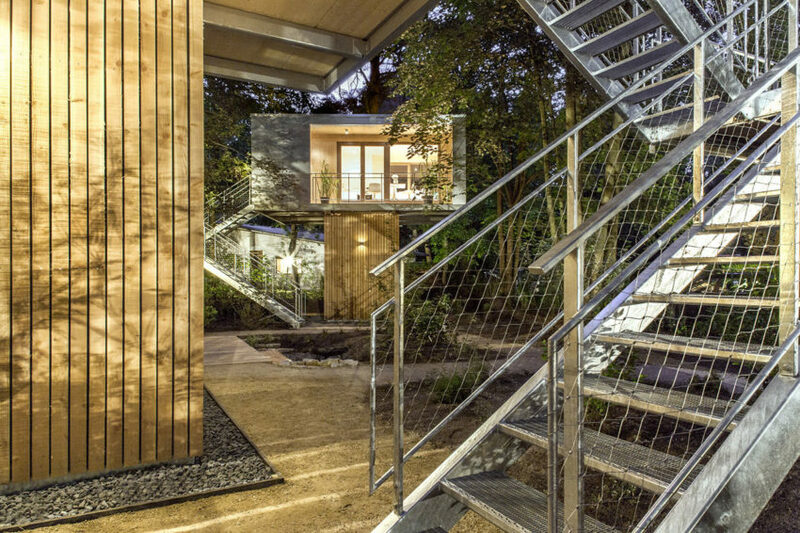 The building’s utilities, supply circuit and storage space for garden tools and waste are located in the base that is lined with larch slats. The load-bearing design, supports and frame above it consist of galvanised steel sections. 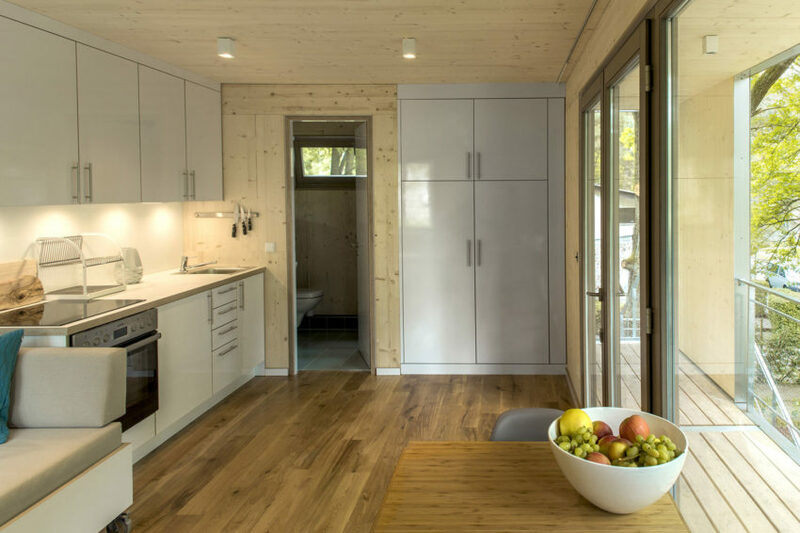 Solid prefabricated five-layer spruce panels are used in the walls, ceiling and floor. 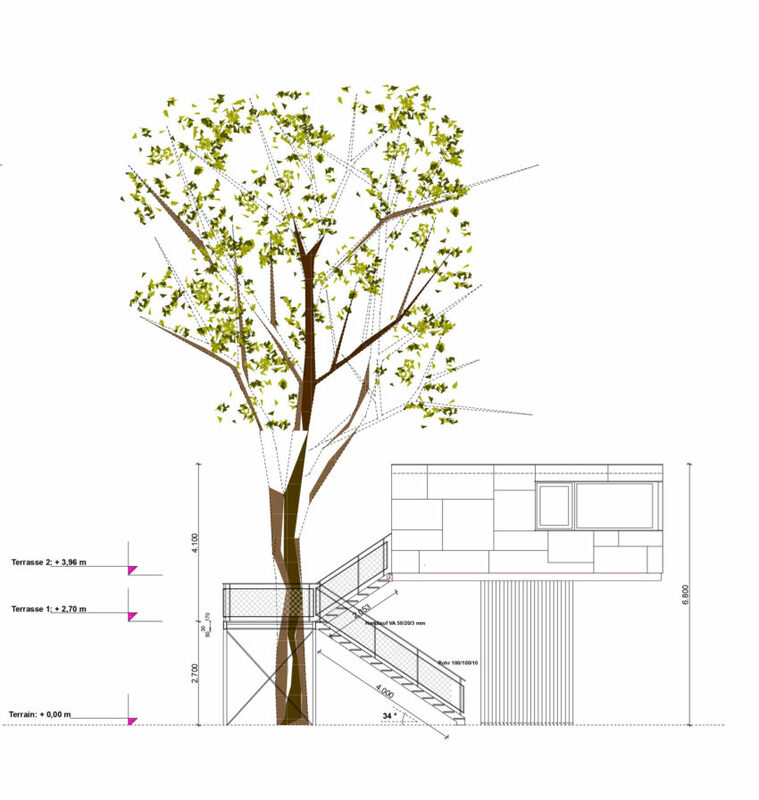 The advantage of this construction lies in its structural and ecological qualities. These solid wooden parts have a high insulating quality, are breathable, have a high heat storage capacity and can be installed quickly and easily. The rear-ventilated façade consists of aluminum composite panels. Depending on the angle of the light, this can result in a vivid interplay of colour on the outer envelope of the buildings. 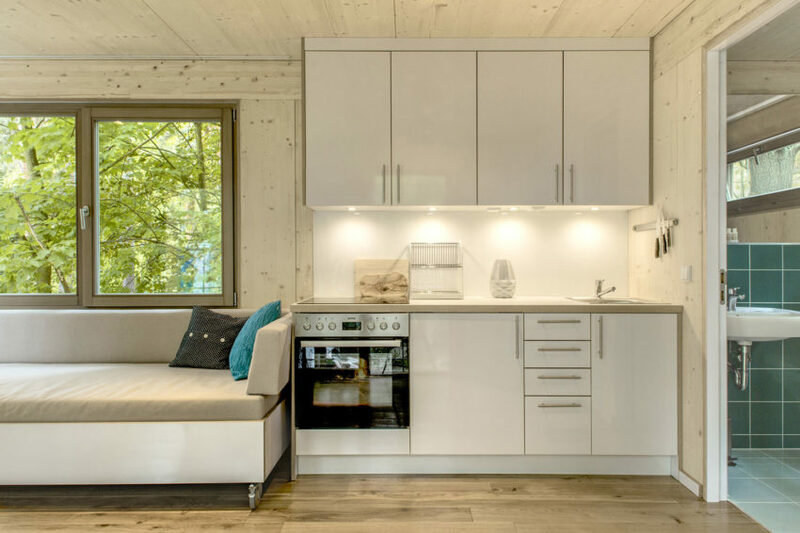 The interior provides everything one could possibly need: a bathroom with a shower, a lightflooded interior featuring a kitchenette and comfortable bed, as well as some beautiful home accessories. 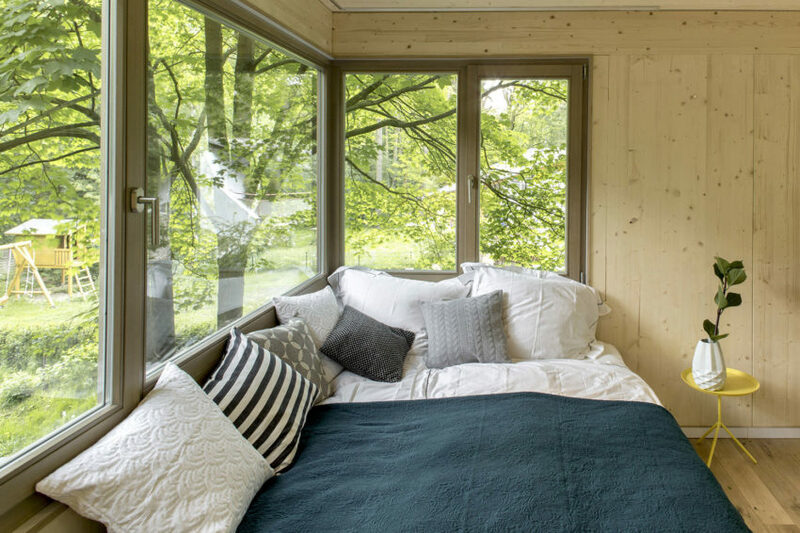 When it comes to the wall and ceiling panels, the solid wood spruce panels have been left visibly in their natural state. 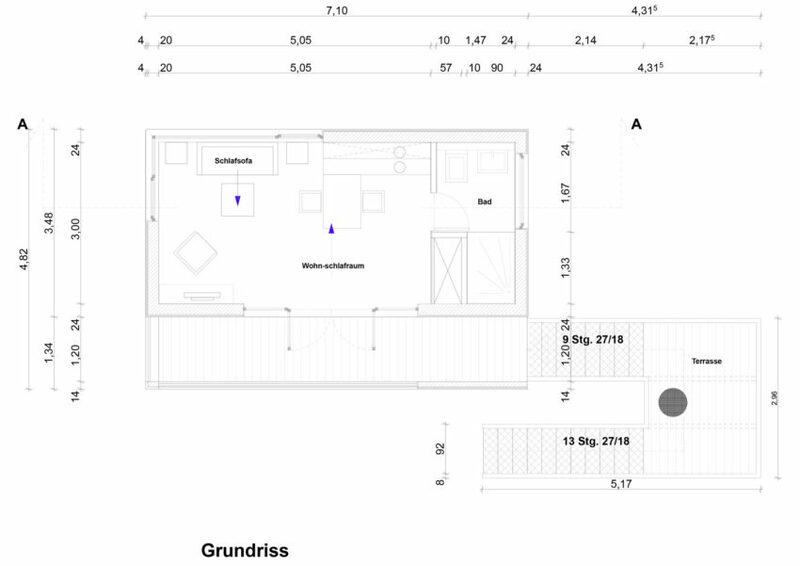 Note: we already published this project in August 2014. This article is an update with more/better shots and drawings.